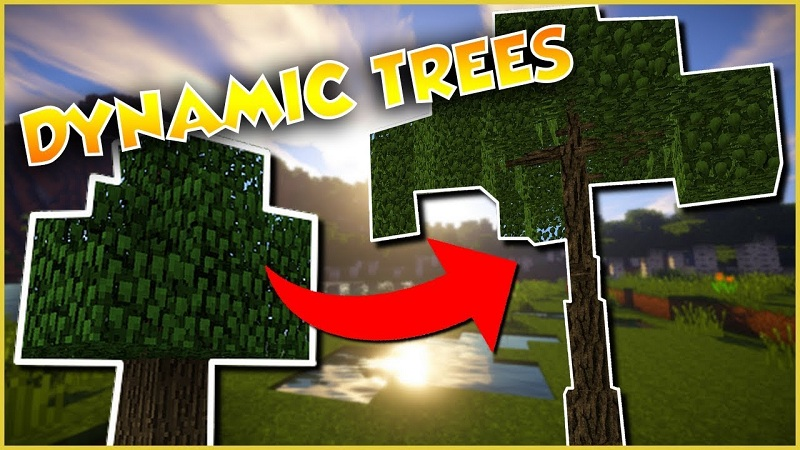 Dynamic Trees Mod 1.12.2/1.11.2 creates more dynamic, aesthetic, fun and natural looking trees while respecting the Minecraft graphic stylization and enforcing a narrow project scope that keeps things simple. 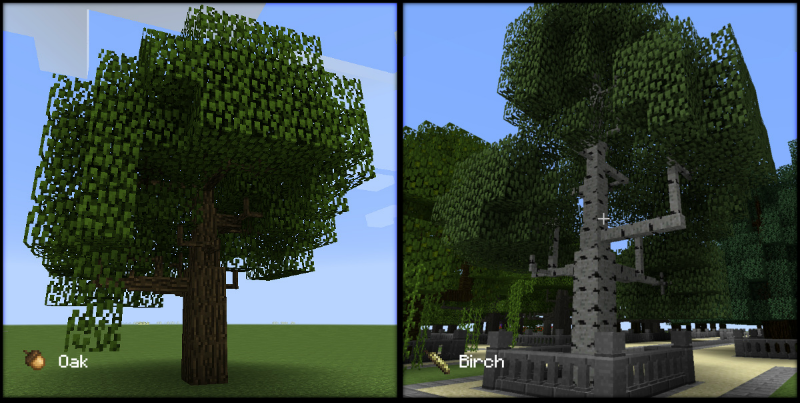 A growing tree is a multi-block structure of rooty soil, branches, and leaves blocks that has many advances over the Vanilla Minecraft tree structures. The formation of the tree starts with a seed. This seed is either planted by hand much like a Vanilla sapling or the seed has a chance of planting itself if left on the ground in a suitable location. The tree then grows from a sapling, slowly increasing it’s size over time, into a full sized tree. The tree can then be chopped down at it’s base and all of the wood claimed at once. Grow from seeds to fully grown trees over time. Grow in natural ways loosely modeled after real world trees and tend to grow in unique, believable ways. Grow around obstacles in a natural way. Are not just reskins but grow using different algorithms per species. Have growth rate and mature sizes that are biome, temperature and rainfall dependent. Drop seeds at random that can potentially plant themselves. Won’t grow in darkness. Leaves not connected to an outer tree branch or starved of light will die. Outer branches without leaves slowly rot away. Will die and rot in a dark place (some species produce mushrooms when they rot). Walking on leaves blocks is slow and sinking. Falling on to leaves prevents fall damage and destroys the leaves. Trees grow step by step. Examples of various fully grown tree species. Provides nutrients to trees and can be depleted over time. Applied with bone meal will increase soil fertility and allows the tree to grow past its mature state. Applied with various brewed potions for different effects(see next section). Special effect particles are created on the entire tree when an acting substance is applied to the soil or bottom-most trunk block. Potion of Regeneration: Freezes the tree by changing all of it’s growing leaves blocks with vanilla leaves blocks and completely depletes the soil. The tree will no longer grow, die in the dark, or drop seeds. The strength and/or duration of the brewed potion does not impact behavior. Take the place of vanilla saplings. Are dropped from tree branches slowly and at random. Have a chance of self planting if setting on a dirt/grass/podzol block and has a clear view of the sky above it. 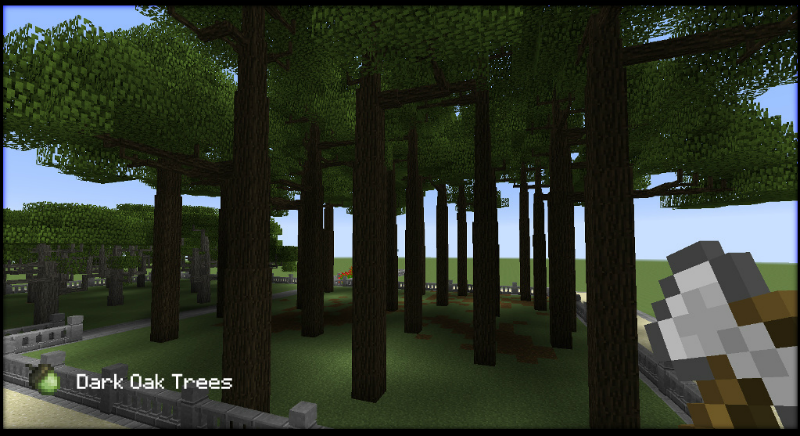 Saplings(Oak, Spruce, Birch, Jungle, Acacia, and Dark Oak) and their respective seeds. 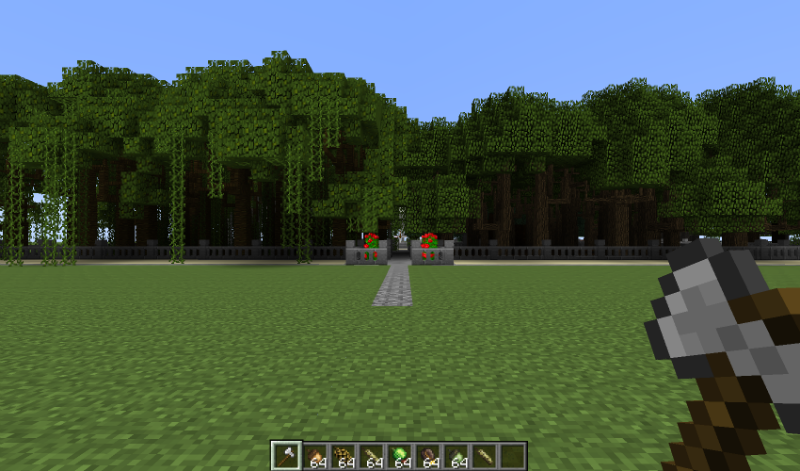 Vanilla trees(leaves, logs, saplings) are not replaced and still spawn and function normally. All drops from growing trees are vanilla leaves, sticks, and logs. 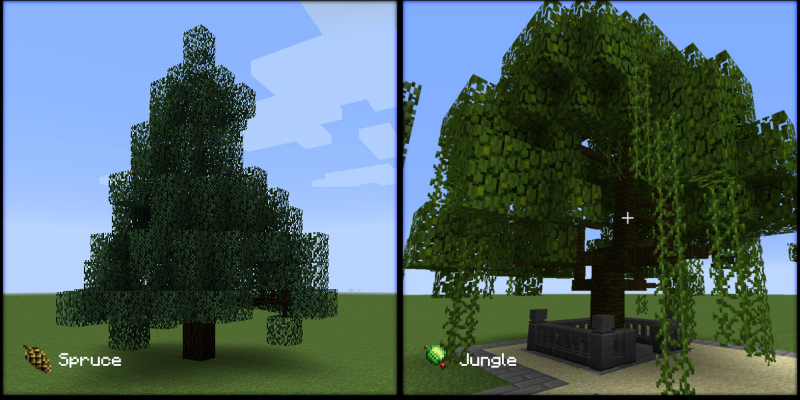 Growing tree parts are not obtainable in survival. Shears only obtain vanilla leaves. Rooty soil drops plain dirt when harvested or left without a tree it will return to plain dirt. 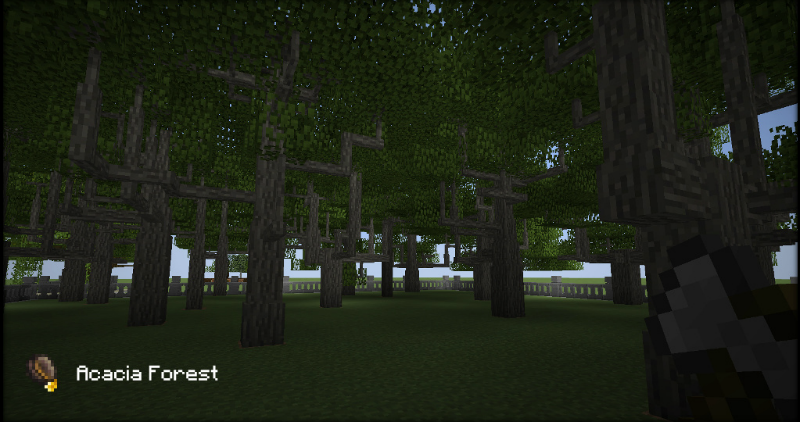 Vanilla textures are used for wood and leaves making it compatible with resource packs that change wood or leaves textures. Seeds can be crafted from vanilla saplings and vice-versa. Fire spreads and burns at the same rate as vanilla tree fires. 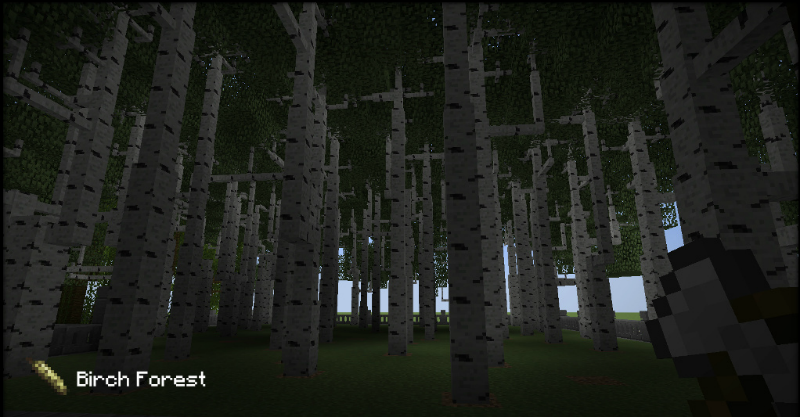 Optional world generation of growing trees to replace world gen of vanilla trees(enable in config file). As trees drop seeds the forest line spreads. Trees compete for sunlight when placed near each other and grow taller and skinnier than trees in the open. This produces a forest canopy effect. 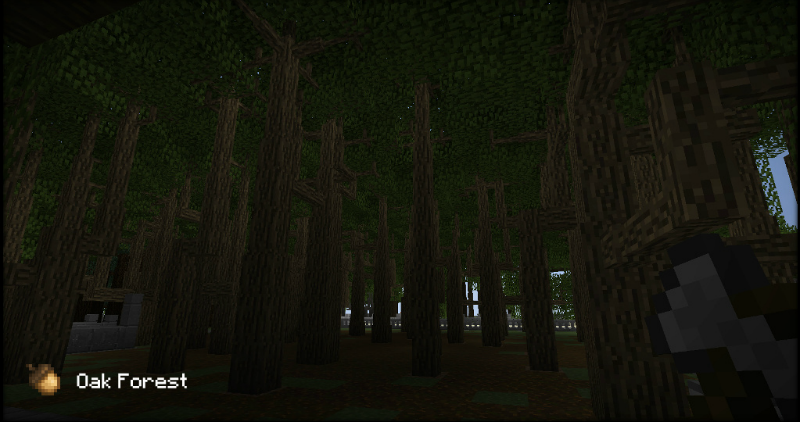 Canopies block skylight producing dark forests where mobs can spawn during the day and saplings fail to thrive. Podzol forms from dirt or grass under the dark forest canopies of some tree species. Podzol is meant to emulate forest leaf litter appearance. Various examples of planted forests. Cutting the tree at it’s base will fell the entire tree. Thicker branches take longer to harvest. Whole branches can be removed from the tree without disturbing the main body of the tree. Harvesting results in vanilla logs and sticks the number of which is calculated as the total volume of wood in the tree or branch. Leaves grow back when destroyed if outer branches are left undamaged. Trees grow using a combination of a cellular automata algorithm for leaves and branch network logic for trunk and branches. No tile entities are used. 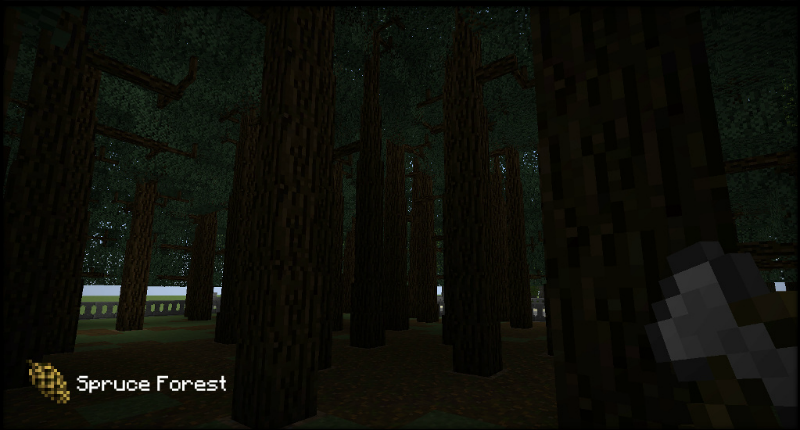 Rendering is done with ISimpleBlockRenderingHandler(1.7.10) for better performance with large numbers of tree nodes. BakedModels are used for 1.10.2 to the same effect. Blocks are only updated with updateTick() so chunks are re-rendered when dirty no more than with vanilla crops. Listener interface is used for bottom leaves blocks tick for creating seed drops and other effects. New listeners can be registered by other mods to expand tree behavior. All block states are encoded in the 4 bit metadata. Growing leaves blocks use 4 species sub-blocks to a Block using metadata encoding for conserving BlockIDs. This mod registers 10 blocks total(11 with ComputerCraft). Worldgen uses a custom variation of Adaptive Incremental Stippling(AIS) using the PoissonDisk Distribution. To provide advanced growing versions of vanilla trees. Zero to minimal configuration. Should work out of the box with sane settings or defaults. 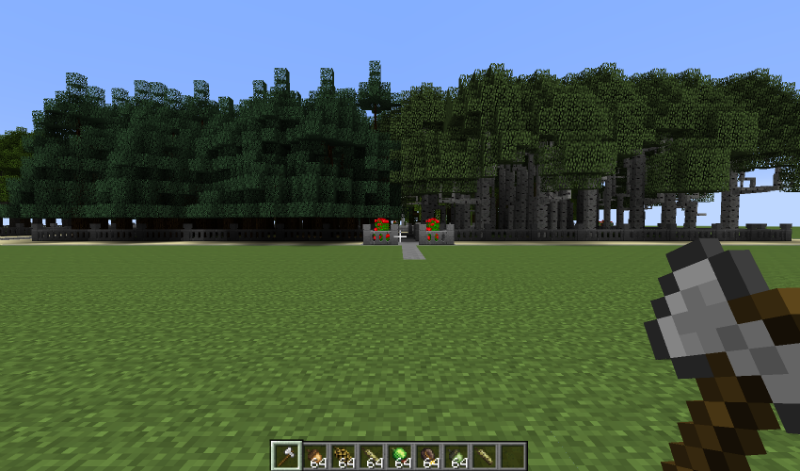 Provide interfaces for other mod developers to expand the mod with add-ons, new trees, effects, mobs and other things. Response to seasonal changes is considered inside the scope of the project. To achieve compatibility with other popular mods when appropriate. Tree trunks thicker than 1 block and up to 3 blocks thick. Should be possible using special “shell” blocks. Seasons. In autumn the trees turn fall colors, in winter leaves fall off completely and regrow in spring. 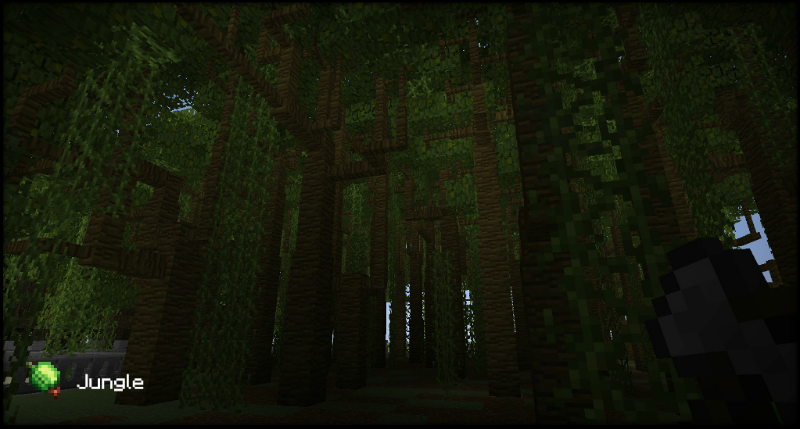 Maybe work with Minecraft seasons mod. Falling leaf particles, especially in autumn. Cacti and Giant Mushrooms could be considered treelike and therefor not outside the bounds of implementation. Trees that fall over when harvested(special effect).